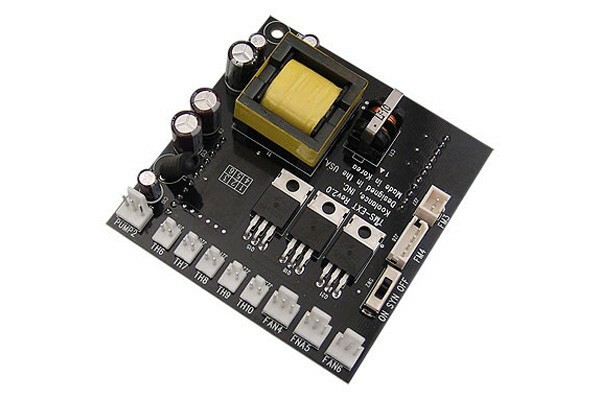 The TMS-EB200 Expansion Board doubles the number of components which an the controlled and monitored by the TMS-205 (Item No. : 70199). To get an impression of how the software looks with the Expansion board some screenshots can be seen here. Note: The TMS-EB200 Expansion does not work without the TMS-205 (Item No. : 70199). Note: Koolance wishes to note that not every flow rate sensor is compatible. Koolance recommends using Koolance sensors, especially due to connector compatibility. Note: Koolance switches the pump portfolio to 3-Pin connectors with rpm signal. For this we will offer an adaptor soon, the Item No. will be announced. Rebuilding the pump yourself will void the warranty.